Hey you’all, it’s me again! Today we’re going to start reviewing some of the cards from the upcoming booster box Triple D Booster Pack Alternative Vol.1 (D-BT01A) “Buddy Rave”! The alternative! A new power in your hand! Dance to a wild new beat with Buddy Rave! Before we begin let me explain what D-BT01A contains! 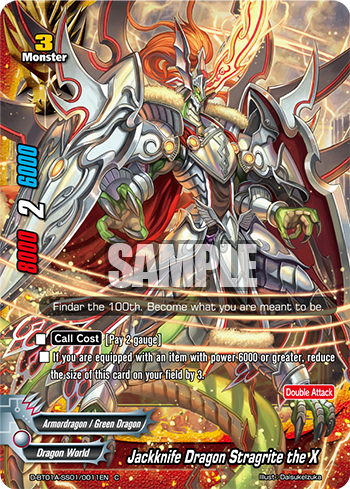 This new booster is the first set exclusive to the English Edition Future Card Buddyfight! It includes a mega combination of cards from three releases in the Japanese counter-part, namely Triple D Special Series Vol.1 (D-SS01), Triple D Extra Booster Vol.1 (D-EB01), and Triple D Extra Booster Vol.2 (D-EB02). Familiar fan favorites and new monsters take the stage in this alternative set! Keep your eyes peeled to its release! Today, we will be going through some of the new key cards from D-SS01! They are powerful cards to level-up your Gold Ritter and Azi Dahaka decks, which are used by Tasuku and Kyoya respectively! 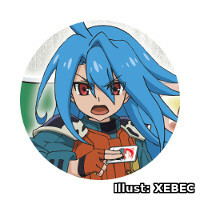 Let’s check out these cards starting from Tasuku’s Neo Gold Ritter cards! An alternative way to equip the powerful “Jackknife “Gold Ritter””!! Calling this monster is one really convenient way to equip “Jackknife “Gold Ritter”” without the need to assemble the souls needed in its original [Call Cost]. Simply play this card on top of a monster with “Jackknife” in its card name that has two souls, and you’re gold! 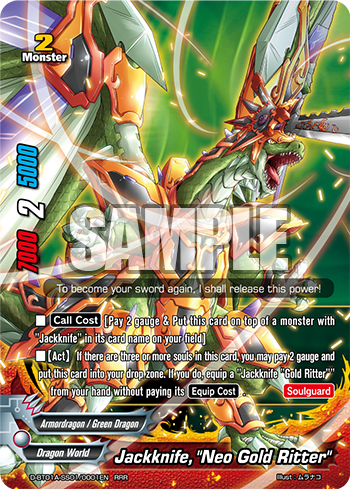 A super useful Jackknife to build up to Neo Gold Ritter, as this card cannot be destroyed by the effects of your opponent’s cards!! Use “Jackknife, “Gewalt”” to quickly build up Neo Gold Ritter’s soul without the fear of being destroyed! After equipping Gold Ritter, use this monster to easily gain the upper hand! This card becomes a size 0 as long as you are equipped with an item of power 6000 or greater! Very useful for other decks with high powered items! 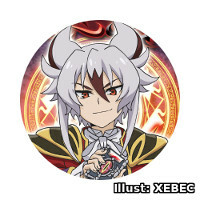 Next, we have some cards from the fearsome deck of Kyoya Gaen! Leave a path of destruction! Only in extinction can there be rebirth! 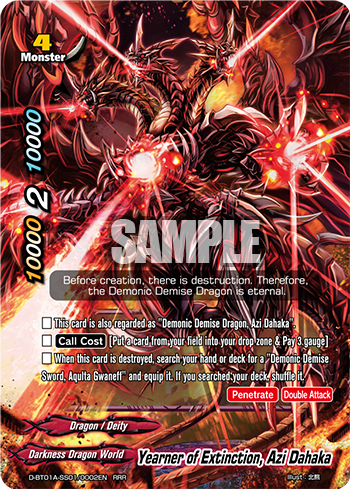 “Yearner of Extinction, Azi Dahaka” is a new form of the fearsome “Demonic Demise Dragon, Azi Dahaka“. 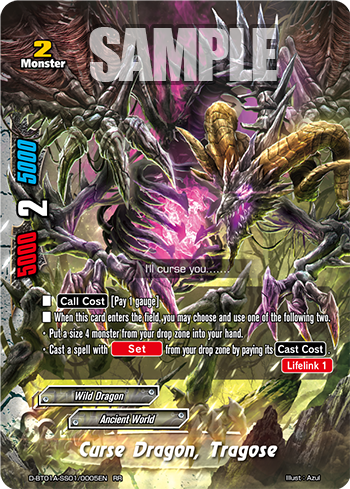 Taking this new form, it is able to deal 4 damage easily instead by [Penetrate] and [Double Attack], and yet is regarded as the same monster as “Demonic Demise Dragon, Azi Dahaka” in all zones. When defeated, search your deck for “Demonic Demise Sword, Aqulta Gwaneff”!! “Wicked Lord Dragon Sword, Aqulta Gwaneff” is also a new form of the terrible “Demonic Demise Sword, Aqulta Gwaneff”! Being regarded as the same sword, either forms of Azi Dahaka can search for either form of Aqulta Gwaneff according to your situation!! 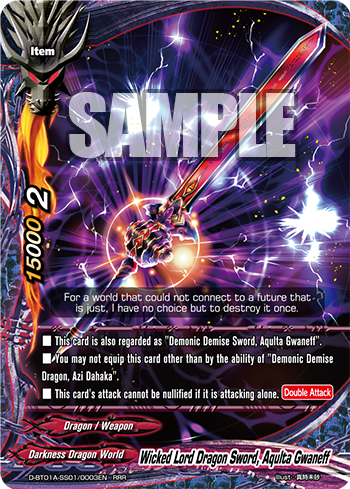 Pick Wicked Lord Dragon Sword for [Double Attack] that cannot be nullified, or “Demonic Demise Sword” with if you’d rather blow terrible strike! More in the line up is a cheap monster that allows you to retrieve Azi Dahaka from your drop zone, or to set “Dragon Throne” on your field! 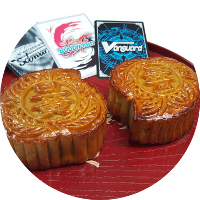 This multi-purpose card is perfect for setting up your grounds and play those fearsome Dragon Ein cards! That concludes today’s mini showcase! 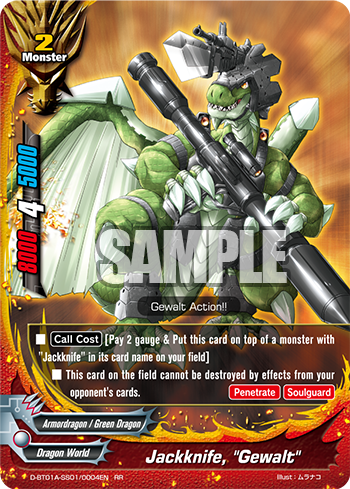 Over the weeks leading to its release on June 24th, more and more cards from D-BT01A are going to be revealed on our Card of the Day features! Be on the look-out for new impact monsters from D-EB01, as well as cards with brand new attributes from D-EB02!! Triple D Booster Pack Alternative Vol.1: Buddy Rave releases on June 24th! In a few weeks, I’ll also be back to review more picks from D-BT01A! Stay tuned to this weekly column for Part 2!